Deadpool announces that Deadpool writer Daniel Way will write the Deadpool game, possibly starring Deadpool. Marvel Comics and Deadpool fans were very excited to see the Deadpool game trailer at Comic-Con, thanks in no small part to an accurate portrayal of the character consistent with Daniel Way's comic books. Featuring Deadpool's signature fourth wall breaking conversations with his split personalities, over-the-top violence, and Deadpool behaving like, well, Deadpool, the trailer assured comic book fans that the game would remain true to the original character. But Marvel and developer High Moon aren't stopping with Comic-Con's announcement; the team is "letting" Deadpool run their entire marketing campaign, including the official website, Deadpool's Facebook and Twitter pages, and even a Deadpool-inspired press release. "I, Deadpool, 'hired' Peter Della Penna and his physically embarrassing team at High Moon Studios for two reasons," Deadpool's press release reads. "First, because of their close proximity to Mexico so I can get fresh, authentic chimichangas delivered daily ... Second, if High Moon can make an amazing game about big transforming robots look cool, then they can surely make me look amazing in a third-person action video game, from all angles (seriously Peter...my bottom is my good side, so don't screw this up)." Keeping the tone of the game and marketing closely tied to the comic is no accident. Penna reveals later in the press release that Daniel Way has written the story for the game, bringing his signature Deadpool humor to the title. 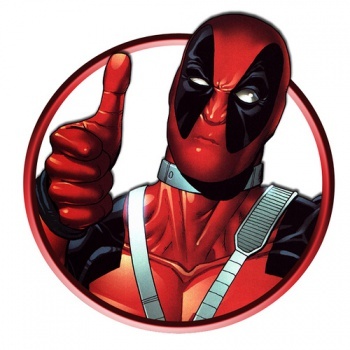 "We weren't actually planning on making a Deadpool game," said Penna. "But,Deadpool came by the studio one day, said he was taking over, and that if I didn't hire Marvel writer Daniel Way pronto and make the most amazing Deadpool video game, he'd break both of our arms and beat us to death with them. I have kids, so we're making the game." Deadpool hasn't always been adapted as well as comic book fans would have liked. In games, Deadpool tends to appear as a minor antagonist against other, more popular heroes. Much more out of character was an appearance in X-Men Origins: Wolverine with his mouth stitched shut, which kinda defeated the whole point of his "Merc With A Mouth" tagline. The announcement that Way is writing the story should lend itself well to proving that High Moon is finally making the game that Deadpool fans have always wanted to see. Amazon currently lists the game's release date for December 31st, 2013, with pre-orders available now. So, after this he's gonna be in Street Fighter V, right? I hope this is good, I really do. Along with Stephen Heck, it's one of the few roles Nolan North does that I enjoy. Linkara: Dammit Deadpool! Stop breaking my wall! Please don't try to remind me of X-Men Origins: Wolverine's take on Deadpool. I just can't get past how badly they threw Deadpool under the bus to make a Wolverine movie. OT: A Deadpool game could be fun if they can capture the sense of humor that has worked so well in his comics. I hope this is good, I really want this to be good. Just don't make him as UNfunny as he was in Marvel Ultimate Alliance 2! He was funny in the first one though. I'm hoping that it is at least decent. I don't expect groundbreaking quality or innovation but please make it a game that is worth 40€ for a Deadpool fan. i hope they use a different texture for his costume. because in the trailer, the mterial of his suit looks...weird. December 31, 2013: the one date that sounds almost too late to be true, with the title "Dead Pool"
Something tells me this is some kind of joke. No. He DOES get to be on the cover though. There was a movie version of Deadpool? In all honesty I'm getting my hopes up for once. I enjoyed Deadpool in Shattered Dimensions. He was really the only boss I liked in that game. And while Nolan North's voice is like nail on a chalk board sometimes, this is not one of them. Least of all because he also voiced Deadpool in animated versions, so I'm used to it in this context. I am not well known with the character, but from what I understand, maybe a DMC/MaxPayne crossover (talking totally gameplay wise here) may be best suited for a comicbook character wielding 2 guns? Actually, there was. It does not behoove us to lie about it. Wolverine did happen. I had to stop myself from impulse buying it simply because I'd like to know what each store is giving for pre order bonuses. ALL PRAISE THE COMING OF THE GREAT ONE! DESTROYER OF SANITY AND PURVEYER OF TACOS! BEHOLD HIS GLORY! FOOLISH CAPTCHA! THE GREAT ONE SHALL SMITE THOU! ...this...is going to be the greatest marketing campaign EVER.